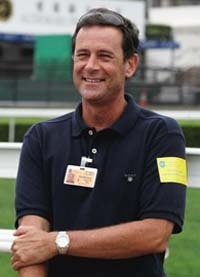 Herman Brown (Dubai Racing Club)Linngari has already been invited to the Dubai Duty Free. That’s the word from VIP Thoroughbred’s trainer, Herman Brown, in a recent interview. “Linngari received the invite last week,” said Brown from his stable office when on a short visit to South Africa this week. “He deserves the run and should be a big runner,” continued Brown. “We may give him one more run before then because it is a long time to the race, just to freshen him up. Linngari was second in the Duty Free last year when beaten by subsequent Japan Cup winner, Admire Moon. Admire Moon was recently voted the best horse in Japan, which is no mean feat considering the quaility of horses in that country.